Around this time of year, meatloaf makes its way back into our family dinner rotation. Grated veggies, minced shallots and fresh bread crumbs deliver a consistently moist and tender meatloaf. The savory apricot-ketchup glaze adds the right amount of tang, making this belly warming entrée rather addictive! Preheat the oven to 350°F. Grease a 9 x 5-inch loaf pan with butter. In a sauté pan, melt the butter over medium heat until it begins to bubble. Add the celery, carrot, shallots, garlic and sauté, stirring occasionally, for about 5 minutes until the vegetables soften but do not brown. Remove the pan from the heat and set aside to cool. In a large bowl, combine the turkey, bread crumbs, eggs, thyme, salt and pepper. Add the sautéed vegetables and mix thoroughly with a large spoon or your hands. Form a loaf in the pan and bake for about 45 to 55 minutes until cooked all the way through. Mix the apricot preserves and ketchup in a small bowl. 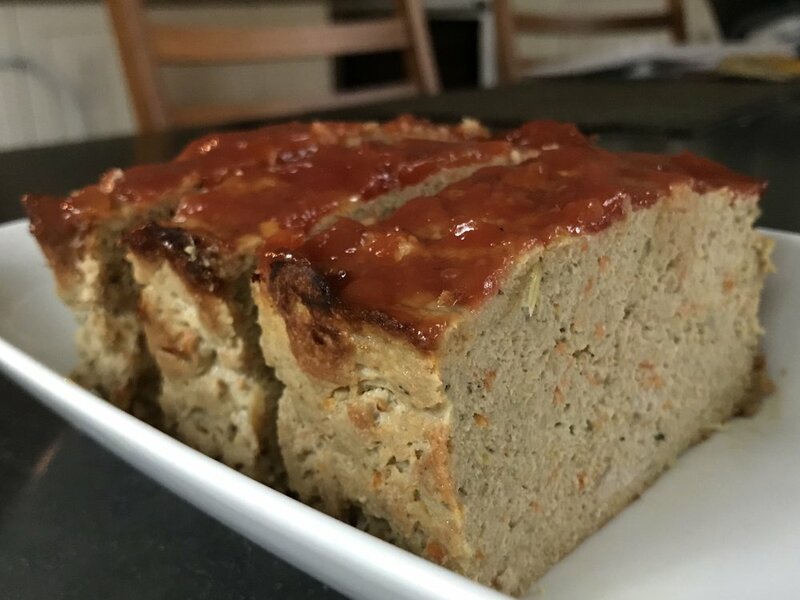 When meatloaf is done, spread the apricot-ketchup glaze on the top and let the meatloaf rest in the pan for about 10 minutes, covered, before serving. Fresh breadcrumbs are more moist than dried and keep the meatloaf tender. Chop up several slices of bread into cubes. I use whole wheat but you can use white, sourdough or gluten free. Transfer cubes into a food processor fitted with a metal blade and pulse until bread is coarse and crumbly. The crumbs will be larger and more coarse than dried store-bought varieties. On Monday mornings I want to hit the ground running. Having fuel for the day (and for that matter the rest of the week) requires a little time and planning in the kitchen. While I make the kids their school lunch in the morning, I make mine too and stash it away in the fridge. That way I’ll have something tasty and nutritious all ready to eat when my stomach starts to rumble around noon. These almond muffins are my answer that afternoon hunger call – you know the one that dials in around 3 pm looking for energy and sustenance to get you through the rest of the day? Dense, moist and flavorful, they satisfy my desire for a little something sweet and are chockfull of super foodie ingredients like almonds, chia seeds and blueberries that I know will hold me until dinner. When I checked my freezer this morning to find no almond muffins in sight, I panicked for a moment. I grabbed the almond flour, spices, chia seeds, vanilla, honey, eggs and frozen blueberries and in just 10 minutes I popped a new batch into the oven. No kidding. That’s the beauty of what I call pantry recipes - recipes that rely primarily on ingredients that you store regularly in your kitchen. Now I’m all set for the day. *I like Bob’s Red Mill Natural Almond Flour or Trader Joe’s Just Almond Meal because they are ground with the almond skins intact. Coat a non-stick muffin pan very well with canola or coconut oil. Fill each baking cup evenly with the batter and bake for 18-22 minutes until muffins are brown and cooked through. They should feel slightly firm to the touch. Gently run the blade of a butter knife around the edge of each muffin to loosen and let cool on a baking rack for 15 minutes before transferring to a serving plate or a storage container. These muffins freeze well. This recipe originated at the Blum Center for Health where I worked as a kitchen assistant discovering, among other things, that delicious food and nourishing food are not mutually exclusive. This was a bit of a revelation coming from the French Culinary Institute where butter was your best friend. A super healthful option to serve with cut up veggies or crackers, this flavorful dip is packed with fiber, protein, heart healthy fats and a load of essential vitamins. Edamame and avocado are satisfying and nutritious ingredients on their own; pulse them together with refreshing cucumber, spicy jalapeno, herbaceous cilantro and tangy citrus and the results are luscious and highly addictive! Make sure you use a ripe avocado that yields to some gentle pressure. If the avocado is firm to the touch, it’s not ready. I often buy firm avocados and let them ripen on the counter, and then keep them in the fridge until I'm ready to use them. And don't forget to keep that lemon and lime at your side; you’re going to need them along with a pinch more salt to bring out all the flavors! Blend all ingredients in a mini food processor or blender, scraping down the sides once or twice. Taste and add more lemon juice, lime juice or salt as desired, and add a few drops more water or lemon juice if dip is too chunky. To prevent the dip from turning brown, store in the fridge with a piece of plastic wrap pressed to the surface. It’s around this time of year that I finally get to pull out my soup pot and leave it on the counter within arms reach, a sign that the cool autumn weather is officially here to stay. With its luscious orange hue and creamy texture, it’s no wonder that butternut squash soup is a quintessential favorite. There are many versions; this one plays up the natural sweetness of the squash, enhanced with a judicious amount of spice. I love two practical things about this recipe. First, it’s a pantry-driven recipe, meaning that I have most of the ingredients on hand in my kitchen, save the squash. Second, it only takes about 30 minutes to prep. The real magic happens in the simmering pot and in those final moments of tweaking the flavor with a splash of fresh lemon juice and maple syrup. Heat the oil and butter in a soup pot over medium heat. Add the onions, cumin, coriander, cinnamon and 1 teaspoon of salt, and cook uncovered for 8-10 minutes, stirring occasionally, until the onions are tender, but not browned. Add the ginger and stir for about 1 minute to release the flavor. Turn the heat up to high, add 1 cup of broth, bring to a boil and deglaze the pot, scraping up any bits that stick to the bottom. Reduce the liquid to half, and then add the squash, carrots, apple, the remaining 2 cups of broth and 2 cups of water. Bring to a boil, skim any foam from the surface and then reduce the heat to a simmer. Cover the pot and cook for about 30 minutes, until squash and carrots are fork tender. Let the soup cool slightly. Then, remove and set aside 1 cup of the liquid and puree the soup, in batches if necessary, using a blender or food processor. It should be a bit thick and slightly sweet. Add more of the reserved liquid to create the consistency that you like. Transfer the pureed soup back to a clean pot, and then add 1 teaspoon of lemon juice and 1 teaspoon of maple syrup. The acidity of the lemon and sweetness of the syrup will help draw out the subtle spices and flavor. Add freshly ground pepper and additional salt, if desired. Give it a taste, add a bit more lemon and syrup if you think the soup could still use a little flavor boost. When ready to serve, heat the soup thoroughly, ladle into bowls and top with toasted pumpkin seeds. Save a few orchard apples to bake these scrumptious muffins that have been nutritionally elevated with yogurt, freshly grated apples and white whole-wheat flour. Great for breakfast or an afternoon snack, you can delegate the easy prep to the kids. No fancy machinery required; just a box grater, a fine mesh strainer and of course, a muffin pan! Preheat oven to 400° F. Coat a 12-capacity muffin pan with cooking spray. In a small dish, mix 1 tablespoon of sugar with ¼ teaspoon of cinnamon, and set aside. In a medium bowl, sift the flour, baking soda, salt and 1 tsp cinnamon together using a fine mesh strainer or sifter. In separate large bowl, whisk together ¾ cup sugar and the canola oil until well combined. Add the eggs to the mixture, one at a time, stirring well after each addition. Then add the vanilla. To combine everything together, add some of the flour mixture into the wet ingredients in several batches, alternating with the yogurt. Mix until just combined, and then gently fold in the grated apple. Pour the batter into the prepared muffin pan and sprinkle with the cinnamon-sugar mixture. Bake for 18-22 minutes, until a wooden pick inserted into the center of one of the muffins comes out clean. Let muffins cool on a wire rack for 15 minutes. *White whole-wheat flour is lighter in taste and texture than regular whole-wheat flour, but still contains the nutritional whole grain benefits. I like King Arthur Flour, which you can find in most local stores, and on-line. *Chances are, you’re not measuring flour correctly, and that can throw off your baking results. Sticking the measuring cup directly into the flour will yield more than you need. Instead, follow the fluff and fill method: Fluff the flour first with a fork, then spoon it into the measuring cup, and then level it flat. Chicken Marsala is a signature Italian dish, and it's back as a staple in my weeknight dinner rotation now that fall is in the air. It doubles as an impressive (but easy) meal for company as well! I like to serve it with soft polenta which tastes delicious soaked in the Marsala sauce, along with some crunchy green veggies like string beans or broccoli, to vary the textures. While the recipe will hold up fine without the fresh rosemary, it adds depth of flavor, so it's worth buying; it will stay good in the fridge for up to 10 days. Put the chicken breasts side by side on a cutting board and lay a piece of plastic wrap over them; pound with a mallet or rolling pin until they are about ¼ inch thick. Pat dry and season generously with salt and pepper. Put some flour in a shallow platter and dredge the chicken on both sides, shaking off the excess. In a large pan, heat 1 tablespoon of the butter and 1 tablespoon of oil over medium-high heat. When the pan is nice and hot, add 4 pieces of chicken and cook until golden brown, about 2-3 minutes per side. Transfer the cutlets to a plate and cover loosely with foil. Add another tablespoon of butter and tablespoon of oil, and cook the remaining cutlets until browned. Transfer to the plate and set aside. Add 1 tablespoon of oil to the pan. Add the shallot and garlic. Saute until fragrant, about 30 seconds. Then add the mushrooms, season with salt and pepper, and saute until tender and the juices evaporate, about 3-5 minutes. Add the Marsala wine. Bring to a boil and reduce to simmer until Marsala reduces by half. Add the broth and the rosemary sprig, bring to a boil, and then simmer until reduced by half. Remove the rosemary sprig and return the chicken to the pan along with the pan juices. Cook until heated through, turning to coat. Stir in the remaining tablespoon of butter, if desired, to thicken the sauce. Taste, add more salt and pepper as desired, and garnish with parsley. In the heat of summer, this zingy and slightly sweet quinoa salad hits the spot! The trick is to adjust the seasonings at the end ---- a good amount of lime and salt will elevate the flavors to deliver the ultimate YUM factor. Heat the coconut oil in small pot. Add the rinsed quinoa and let it toast, stirring occasionally, for 3-4 minutes until the quinoa is coated and starts to stick to the pot. Then add 1 ¾ cup water, ½ tsp salt, and bring to a boil. Lower the heat to simmer, cover and cook for about 20 minutes, until the liquid is absorbed. Take the pot off the heat, gently fluff with a fork, add lime zest and coconut flakes, and let sit partially covered for another 10 minutes. Transfer quinoa to a bowl, and let it cool to room temperature. To cool the quinoa more quickly, spread on a baking sheet with afork. Add the remaining ingredients: cilantro, currants and red pepper. Drizzle with dressing and toss gently. Taste, and add more lime, salt, or pepper, to your liking. Refreshing and light, this salad is the perfect antidote for a hot summer evening. It’s bursting with seasonal ingredients available at your local farmers’ market: juicy watermelon, ripe tomatoes, and sweet-smelling herbs. Heirloom tomatoes come in a variety of beautiful colors. Look for a mix of yellow, orange and red varieties, and choose a mild feta that won’t overpower the fresh produce. Place the watermelon and tomatoes in a large bowl. Season with ¾ teaspoon of kosher salt and ½ teaspoon freshly ground pepper. Toss gently and then drain excess liquid from the bowl. Add the mint, basil and feta and toss gently to combine. Drizzle the olive oil and lime juice over the salad. Adjust seasoning and serve with lime wedges. Basil is sensitive to the cold. When wrapped up and stored in a chilly fridge, its leaves will quickly wilt and brown. Instead, you can extend the life of your basil by giving it room to breath at room temperature. To do this, trim the stems as you would cut flowers to remove dried-up ends, then stick the bunch in a tall glass of water. Loosely cover the basil with a plastic bag and keep it on the counter. Now your basil will stay fresh for a week or more. Change up your usual BBQ seasonings with this Indian-inspired marinade that tenderizes the meat and adds a ton of flavor! When ready to grill, take the chicken out of the fridge 30 minutes in advance. Wipe off excess marinade, put 4 chicken cubes on each skewer, and season with salt and pepper. Pre-heat the grill to medium-high (400-450 degrees) and make sure grates are wiped clean to avoid having the chicken stick to the grill. Cook chicken about 5 minutes per side, until meat just cooked through and no longer pink. Place skewers on a plate, cover loosely with foil, and set aside. While chicken is resting, lightly grill the bread on each side until warmed through. In a separate bowl, mix the cucumber, tomato and scallions, and season with salt and pepper. For the assembly, place one piece of bread on a plate, sprinkle with half a cup of chopped salad, top with one chicken skewer and serve with lemon wedge and tzatziki or yogurt, if using. Place chicken breasts on a cutting board and lay a piece of plastic over them. With a meat mallet or a rolling pin, pound to ¼ inch thickness. You will have 7 or 8 pieces. Pat cutlets dry, and season generously with salt and pepper. Pour some flour in a shallow dish and dredge chicken, shaking off the excess. In a large skillet over medium-high heat, melt 1 tablespoon of butter with 1 tablespoons olive oil. When butter and oil start to sizzle and pan is hot, add several pieces of chicken and cook until golden brown, about 2-3 minutes per side. Transfer chicken to a plate and cover loosely with foil. Add 1 more tablespoon of butter and 1 more tablespoon olive oil to the pan and cook remaining pieces of chicken, browning both sides in same manner. Transfer chicken to the plate to keep warm. Into the pan add the lemon juice, stock, white wine and capers. Bring sauce to a boil, scraping up brown bits from the pan for extra flavor with a wooden spoon. Reduce heat to medium and simmer for 5 minutes. If desired, add an additional tablespoon of butter, which will thicken the sauce. Add the chicken back into the pan until just heated through, turning to coat. Taste and add more salt, pepper or lemon juice as desired. When ready to serve, garnish with parsley. This slaw is light and refreshing, a great side dish for any barbeque or summer meal. I love how the citrusy and slightly sweet flavors meld together, functioning as the perfect complement to hearty grilled meats and finger-licking-good BBQ sandwiches like pulled pork. I prefer napa cabbage because it’s more tender and slightly sweeter than most others, but any cabbage will do in a pinch, as long as you shred it finely. Choose mangoes which are firm so they are easier to julienne. From the great watery crunch of the jicama, a Central American root vegetable, to the fleshly sweetness of the mango, this satisfying slaw is delicious warm weather fare. Julienne the mango and the jicama by cutting ⅛ inch thick slices and then patiently cutting those slices into matchstick strips. A more firm mango makes this easier. Shred the cabbage finely, mince the cilantro and combine all ingredients in a large bowl. In a small bowl, mix the lime juice, rice wine vinegar, oil, ½ tsp salt and a good amount of freshly ground pepper. Drizzle dressing over the salad and mix. Taste and adjust seasoning, adding more salt, pepper or a squeeze of lime to desired taste. The inspiration for this vinaigrette came after eating at my local bartaco in Port Chester. The flavors were bright, well balanced and absolutely delicious. I had to find out what was in it, so, I asked for the basic ingredients and did some testing of my own, until I created an inspired salad dressing that delivered the same zesty punch. The dressing is pleasantly assertive and when paired with a chopped salad of your choice, will liven the greens and create a perfectly tasty dish. Place all of ingredients in a blender and pulse until combined. (Do not overblend!) Taste and adjust seasonings. If too salty, add more lime. If too citrusy, add more salt. If too spicy, add a drizzle more honey. Dressing should be assertive so that it retains a full flavor when tossed with salad. Store in fridge for up to 3 days, and serve over chopped salad of lettuce, tomatoes, cucumbers, carrots, onions and mild Mexican cheese such as queso fresco or Cotija. Makes approximately ¾ cup of dressing, good to dress a salad for 6-8 people. I first tasted a very similar asparagus dish like this one at my cousin Barbara's house many, many years ago. She and her husband Ed were gourmands and aficionados of French cooking back in the early 80's, way before the foodie revolution. It was in their home that I first became attuned to how beautifully food could be presented and how attention to balancing flavor and texture in a recipe makes such a difference! Prepare the asparagus: Snap off and discard the tough bottoms of each asparagus spear. If using very thick asparagus, peel the lower ends with a vegetable peeler. Fill a large pan that has sides with water. Add 2 tablespoons of salt and bring to a boil. Add the asparagus and cook for 3-4 minutes, until just done (THINK AL DENTE). Remove the asparagus to a baking sheet lined with paper towels or a clean kitchen towel. Cook the eggs: Fill a medium saucepan with water halfway, and bring to a boil. Carefully add the eggs, reduce the heat and simmer for 10 minutes. Transfer the eggs to a bowl of ice water to cool. Shell the eggs and set aside. Once cooled, chop the egg whites and the yolks separately, and keep in separate bowls until ready to assemble. Make the vinaigrette: In a small bowl, place the shallots and vinegar, and let shallots soften for 5 minutes. Wisk in the mustard, and then whisk in the oil slowly to make a thick dressing. Season to taste with salt and pepper, about ½ tsp salt and ¼ tsp pepper. Note: Some vinegars and mustards are stronger than others, so if you find the dressing too assertive, you can add a tablespoon or two of water. Also, if the dressing tastes to acidic, add a pinch more salt, and visa versa, if it’s too salty, add a bit more vinegar, or a squeeze of lemon. Assembly: Place the asparagus on a serving dish. Pour the dressing over, then layer the chopped egg whites, chopped egg yolks and sprinkle with the minced chives. Sometimes our taste buds need a little splurge. I think a Kale Caesar is one of those perfect opportunities to enjoy a decadent homemade dressing and still feel nourished, given the redeeming qualities of kale. When I want more of a meal, I top this salad with grilled chicken or shrimp, and sometimes a spoonful of croutons for some crunch. I like to use lacinato kale because I find it easier to chop and a bit more palatable when raw than curly kale. This dressing has a lemony, garlicky kick, which the kale can stand up to! The addition of a tablespoon of water helps stretch the dressing and manage the caloric impact. Unlike a traditional Caesar, there is no raw egg, so any leftover dressing will store in the fridge for a few days. The dressing thickens from the rapid emulsification achieved in the mini prep processor or blender. Make sure to chop the kale into thin ribbons by layering a few kale leaves, rolling them, and then slicing into thin ribbons, like a chiffonade. And, toss the kale in the dressing in a large bowl with tongs for a minute or two before plating. This ensures that the dressing coats evenly over the salad. In the bowl of a mini prep food processor or a blender, combine the first 7 ingredients and add ¼ tsp salt (garlic, lemon, olive oil, mustard, anchovy paste, Worcestershire sauce & water). Pulse until well combined. Scrape into a small bowl and gently mix in the cheese. Season to taste with additional salt and freshly ground pepper. Place the kale in a large bowl and spoon about half of the dressing over the kale, and toss together with tongs. Plate and serve with extra dressing on the side. Store any unused dressing in the fridge for up to three days. For many, tofu is an elusive ingredient to prepare at home. There are many different types and restaurant preparations are often lackluster and tasteless, leaving an impression that tofu is not worthy of a spot in the dinner rotation. Largely used in Asian and vegetarian cooking, tofu (pressed soy bean curd) is a great source of protein, relatively low in fat and it’s pretty easy to work with if you use the correct techniques, which I’ve elaborated on in the recipe below. Tofu is indeed bland, which makes it a perfect blank culinary canvas for many styles of cuisine and flavors. 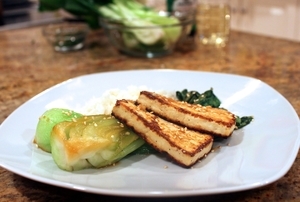 Here, the tofu is prepared with a classic teriyaki sauce and paired with bok choy, another traditional Asian ingredient. I love bok choy for it’s delicate flavor, crunch and nutritional profile. One cup has more than half of the daily recommended vitamins A and C and a mere 10 calories! One last plug for this dish --- all of the ingredients can be stocked in advance and pulled from the pantry or fridge when you’re ready to roll. Even the bok choy can be stored in the fridge for up to 5 days, wrapped in a damp paper towel and placed in a plastic bag left slightly open. (Don’t wash it until you’re ready to cook.) Just remember to drain the tofu at least one hour advance, and then leave it in the fridge until you’re ready to cook. In less than 30 minutes, dinner will be on the table. Healthier, tastier and quicker than take-out! Pat the tofu slices dry, and dredge in cornstarch or cornmeal, making sure to gently tap off the excess to avoid clumps. Next, make the sauce: mix the soy sauce, mirin, water, ginger, garlic, pepper and 1 TB cornstarch in a small bowl and set aside. Make sure the cornstarch dissolves completely. Place a large skillet over medium-high heat, and add 2 TB oil. When the oil is very hot but not smoking, place several pieces of tofu in the pan, adjusting the heat as necessary so tofu sizzles but does not burn. Do not overcrowd the pan and do not push the pieces around as this will keep tofu from actually searing. Let cook until the bottoms are lightly browned , about 5-6 minutes. Flip with a spatula and cook on the other side until browned, and then transfer to a plate. Add another 2 TB of oil and repeat with the remaining tofu slices. Stir the sauce well and then pour about half into the pan. Reserve the rest for the bok choy. Bring to a boil, immediately reduce heat to simmer, and stir for a few minutes while sauce bubbles and starts to thicken slightly. Turn off the heat, then add back the tofu, toss to coat, cover and let sit until ready to serve. In a separate large skillet, add 2 TB oil and heat on medium-high. When pan is hot, add the bok choy and the remaining sauce. Let mixture come to a boil, immediately reduce heat to simmer, cover and cook on low for about 3-4 minutes, until bok choy has wilted slightly and is cooked through. Be careful not to overcook so it doesn’t become soggy. Take the cover off, and using tongs, flip the bok choy wedges to coat them in the sauce. Cook, uncovered, for another 3-4 minutes to allow sauce to thicken slightly, then remove from the heat. Divide the bok choy and tofu into 4 servings. If desired, garnish with toasted sesame seeds, chopped cilantro and a wedge of lime, and serve with rice. · 1 hour or more before cooking, drain the liquid from the tofu by placing it between two paper towels. Put in a shallow dish and place a heavy pan on top to force the excess liquid out. Can be done in advance and then keep the tofu in the fridge until ready to cook. · It is important to completely dry the tofu before cooking. Coating the tofu in the cornstarch also aids in preventing it from sticking in the pan and results in a crisp exterior texture. · You need a hot, oil coated pan for a good sear. The best types of pan for high heat searing are a seasoned cast iron skillets or heavy stainless steel pans. It’s tempting to use a non-stick pan for obvious reasons; if you go this route, only cook on medium heat and allow more cooking time. Studies show that when non-stick pans are overheated the coating may begin to break down and toxic particles can be released.